Serving up the perfect insurance protection. Brewery insurance throughout all of Tennessee. Getting adequate insurance for your brewery can feel like an overwhelming process, but a specialty policy can take the stress out of the situation. The key is choosing an insurer that understands the specific needs and risks you face and then offers a complete, customized package. You also need to remember some elements that are easy to overlook. For example, as an alcohol producer, you need a liquor liability policy. This covers you against claims of damage caused by people who’ve consumed your brew. No matter how tenuous such claims may be, defending them can be a costly process. How can brewery insurance protect you? Use the yellow hot spots and explore how brewery insurance can help protect against common risks. If a patron is over-served at your establishment, you may be held responsible and liable for damages or injuries related to the patron’s intoxication. Liquor liability insurance covers defense costs and damages to persons and property caused by intoxicated patrons. Training staff to recognize patrons who pose a liquor liability risk is a key risk control measure to consider. If a batch of beer is contaminated or in some way unfit to serve, breweries have much to lose, including the cost of additional materials, production time, disposal of product and loss of revenue. If the batch makes it to store shelves, it becomes even more costly, both in direct revenue and brand reputation. Seek coverage for spoilage, contamination and product recall to help offset the costs associated with these events. It’s estimated that three out of five businesses will be sued by their employees. Companies are vulnerable during the pre-hire process, actual employment and during a reduction in workforce. Claims can arise in any size operation. You can do everything right and still be sued. Coverage comes in the form of a standalone policy. This coverage is critical to your risk management strategy as it protects against discrimination, wrongful termination, sexual harassment and other employment-related allegations. There is a high risk of equipment breakdown in the brewery business. When machines don’t work, beer can’t be brewed. You lose valuable time and profits while repairs are being made. Mechanical breakdown is typically not covered under a commercial property insurance policy. Rather, obtaining systems breakdown coverage addresses this exposure. Customers or employees who entrust you with private information, such as credit card or social security numbers, put you at risk. If this data is lost, stolen or compromised, you may be legally obligated to alert those affected by the breach. Securing a cyber liability policy can cover expenses associated with compliance requirements, such as data breach notification, securing legal counsel to advise on incident response, credit monitoring services, public relations expenses and paying for regulatory defense and penalties arising from privacy law violations. Environmental liability exposures are not just for oil companies, nuclear power plants and industrial mining operations. Breweries have wastewater and waste management concerns. Depending on the location of the brewery, previous use of property may also be an issue. Strict liability laws apply to the brewing industry. Court-ordered injunctions, fines and cleanup costs can be crippling. Almost all commercial liability policies contain some type of pollution exclusion. Coverage exists for this exposure through a standalone policy. If open to the public, you are responsible for the well-being of visitors. This exposure is amplified if you offer brewery tours. Given the possible hazards guests can be exposed to, it is important to keep tours confined to safe areas and preplanned routes. General liability insurance provides coverage for bodily injury, physical injury or other personal injury related claims. Workers' compensation coverage is required by law. There is high demand for craft beer, but demand can lead to haste. Haste leads to accidents, accidents lead to injuries and injuries lead to increased workers' compensation costs. Promoting workplace safety and managing exposures can significantly reduce the frequency and severity of workplace injuries. Proactively addressing high risk scenarios helps control workers' compensation costs. Brewing equipment is a significant financial investment. Couple that with an above-average exposure to loss, and selecting the correct coverage here is critical. Commercial property insurance will indemnify you for property damaged or destroyed due to a covered loss. Selecting an adequate limit of insurance that responds to as many perils as possible negates that risk. Automobile exposures are significant, especially if you handle your own distribution. Employees need to be trained and aware of the exposures associated with driving for the brewery. Business auto insurance provides coverage for damages arising out of the use of automobiles for business purposes. A fleet safety program is a critical risk management strategy. As the brewing industry grows, supplies may become increasingly difficult or competitive to acquire. Making sure you have the adequate amount of Chinook hops for your spring seasonal can be the difference between having product to sell or not. Diversifying suppliers, maintaining dialogue with back-up suppliers, monitoring the resource environment and negotiating forward contracts can prevent disruption in production. Insurance coverage for contingent business income can be also obtained. Breweries often participate in numerous events throughout the year. Many insurance policies contain what’s known as a designated premises endorsement. At a high level, this limits coverage to the premise named on the policy (the brewery). Participating in Craft Beer Expo or 5k Fun Run? Liability associated with events like those may not be covered. Make sure you have coverage that extends to any events in which you wish to participate. What do you do if one of your trusted employees is found guilty of doing something dishonest as it relates to his or her work with you? Crime coverage can be obtained in your commercial property insurance policy, but coverage is very limited. Consider a standalone policy as well. If a bonded brewery fails to pay taxes appropriately, the bond amount can be used to pay the owed taxes as well as any other fees that might accompany the unfulfilled payment. The brewer's bond is the cost of admission. They are known by a number of names; alcohol tax bonds, liquor license bonds, ATF bonds and TTB bonds, but they all perform the same function. Government agencies that regulate breweries require bonds to ensure all taxes are paid appropriately. A knowledgeable insurance provider can help you navigate the bonding process. You must also make sure that your property insurance covers not just damage or destruction of equipment and stock, but also any lost profits, particularly if you’re out of action for a while. It’s also worth exploring options for coverage against having to withdraw or recall stock if you discover a safety risk or potential contamination. And don’t forget other general business insurance elements such as workers’ compensation, employee claims and liability for visitors to your premises. For more details on how specialized insurance can protect your brewery, contact us today. Let’s discuss your brewery insurance. One of our insurance advisors will reach out to you to review your information and present you with the appropriate brewery insurance solution. There’s no obligation, just good-old-fashioned advice. William Blount Risk Advocates offers comprehensive brewery insurance in Tennessee including, Knoxville, Nashville and all surrounding counties. 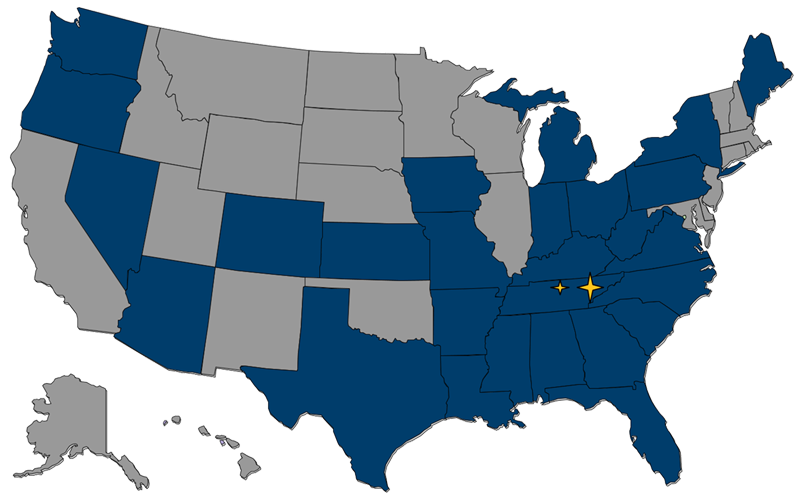 We offer comprehensive insurance solutions in Tennessee including, Knoxville, Nashville and all surrounding counties. At William Blount Risk Advocates, we strive to provide a true, concierge client experience which is unique in the insurance industry. We give clients the power of choice from top-rated national and regional insurance carriers.